Most of our wood companion urns can be laser engraved with a custom inscription, usually a name, dates, and a brief epitaph. For ideas on what to engrave, click here. Most of our wood urns can be made in different types of wood to suit your style or color preference; check each product page for details. Our wood cremation urns are made in the USA from real, genuine, solid hardwoods with beautifully stained finishes, making each urn a work of art in honor of your loved ones. 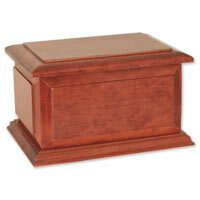 Many of our wood urns also feature the option of a permanent interior divider. This can be used to keep the remains of the two individuals separate, while still displaying their unity by sharing a memorial urn. We offer many elegant metal, wood, and ceramic companion urns in classic shapes, as well as urns with unique dimensional art designs, book-shaped wood urns, urns with roses, photo displays, engraved scenes and designs, a water scattering companion urn, and more. Many of our ceramic urns can be made as companion pieces; see each product page for exact details. If you have any questions about our cremation urns, please call us toll-free at 877-900-5309.